A new range of innovative Australian identification and inspection machines. IN THE pharmaceutical industry, it is no secret that reliability and safety are of number one importance. Identification and inspection processes are essential to ensure products are accurate and dependable. With the introduction of the pharmaceutical industry's Guide to good Automation Manufacturing Practice, or "GAMP" as it is often called, the expectation placed on suppliers of such technology is becoming far greater than some may dare to still anticipate. 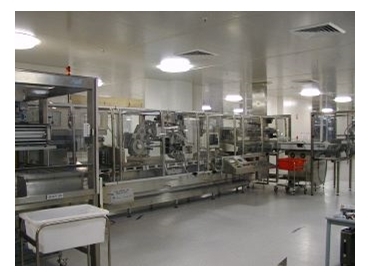 Three years ago, Andrew Donald Design Engineers (ADDE), a Melbourne company, was approached by a pharmaceutical company to develop and manufacture a series of plastic ampoule finishing lines to form part of a substantial new production facility in Sydney. The result has been a new range of innovative Australian identification and inspection machines that are generating considerable international interest. The pharmaceutical company was searching for a design team with the mind-set to remain committed to the process and dedicated to embracing best practice as dictated by GAMP. Chief design engineer George Kourdelis, and the team at ADDE, proved capable of meeting these requirements, using Siemens technology. The fourth finishing line in the series has recently been completed and is ready for shipment and a further two lines are nearing completion. The pharmaceutical company requested that ADDE use Siemens products in the making of this finishing line. As Siemens is well known in the industry, and as this customer uses Siemens products internationally, it specified Siemens' controls to be implemented for these systems. The ADDE machines comprise three main modules: Infeed module with buffer inspection and outfeed module. Each ampoule is tracked as it passes through the machine and its status monitored within a series of shift registers. The machine automatically confirms that individual rejected ampoules have been removed at the reject station to guarantee that faulty product cannot pass downstream to the packing area. Siemens supplied the PLC CPU, hardware with Profibus DP nodes configuration, and the digital input and output technology. The machines have Siemens Micromaster single-phase variable speed drives with internal RFI filtering. The cabling from the motors is connected directly to the terminals on the drives to minimise EMC and RF interference. A Siemens OP 27 panel is used for the MMI with more than 100 screens developed by ADDE to make it easy for operators to control and monitor the machine's functions and production data. Screens for machine setting and diagnostics are accessible under password to further enhance the machine uptime by providing maintenance information. It also provides the facility to set parameters for elements such as servo drives, directly from the machine control panel. Using this Siemens technology, ADDE was able to take a series of processes normally executed as independent operations, including leak testing and printing, and was able to incorporate them into a single machine. This has resulted in better coordination of ampoule production and monitoring of rejects in these new machines that are literally half the size and can be commissioned in less than half the time of their more cumbersome predecessors.